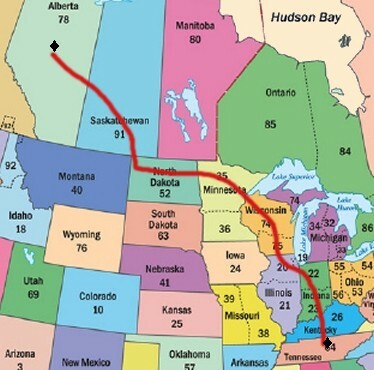 On July 18th, Jim and I set off for a roadtrip/vacation from Nashville, TN to Edmonton, Alberta Canada. We returned home on July 31st. Our mission: To pick up an RV in Elkhart, Indiana (the RV capitol of the world where there’s an RV manufacturer on practically every corner)… drive it to a 3-day IHRA drag racing event in Grand Bend, Ontario (as Jim reports here, here and here)… then drive it onto Edmonton, Alberta and deliver it to an RV dealership there. The motorhome we drove (a 2003 GulfStream Atrium Class A diesel pusher) was one of 5 “used RVs” (plus one brand new RV and a new pull-behind trailer) that this particular RV dealer had purchased directly from the manufacturer in Indiana. 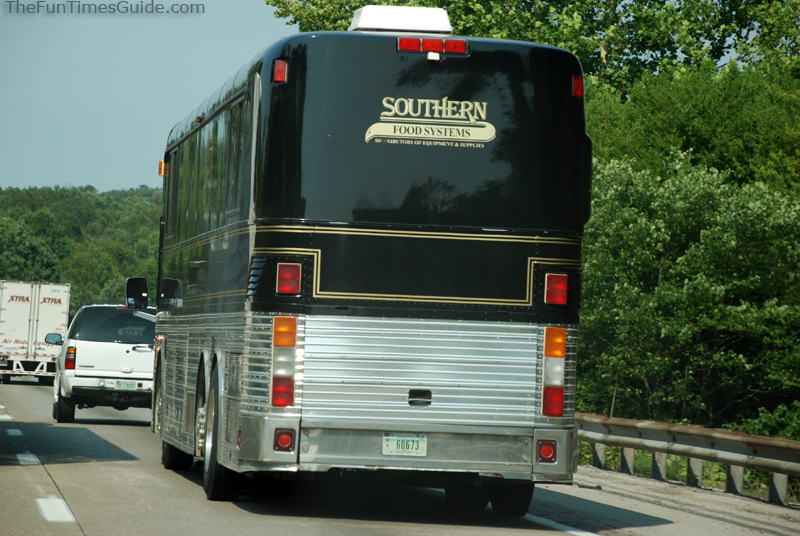 A friend of ours followed along behind us driving a different RV — a brand new 2007 Renegade. And he pulled another “unit” (we picked up on the lingo used in the RV transport business) behind that — a 2007 GulfStream Kingsport towable trailer RV. Jim and I actually drove the 2007 Renegade the first day — when we left the racetrack in Grand Bend, Ontario and had to go back to Indiana to get the towable trailer. 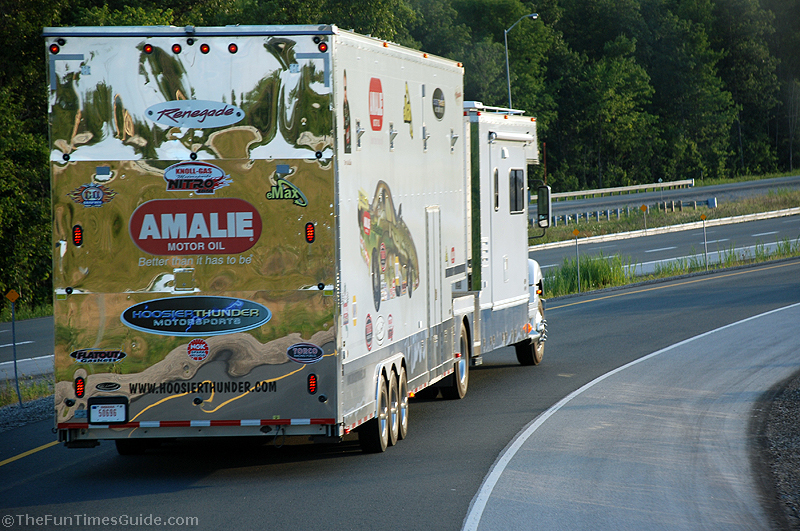 We followed Terry and Rhonda in their 2006 Renegade toterhome (pulling a trailer with the race car in it) part of the way. 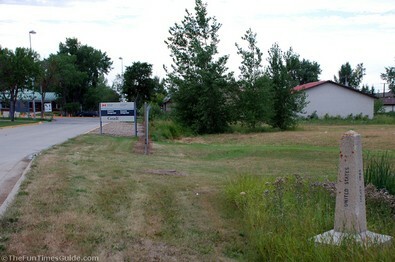 The only “questionable” parts of the trip took place at the border crossing. Since we were attempting to export a used RV from the U.S. into Canada (legally, mind you), border patrol wanted to see the original title in hand. We didn’t have it; we only had a copy. So we had some hoops to jump through at the border before we were permitted to cross. After a dozen or so phone calls to the States… miles of wear & tear on our shoes from walking back and forth from the U.S. into Canada and then from Canada into the U.S… and 4 hours of nervous wondering… we eventually got permission to drive our used RV across the border into Canada. We were free & clear. For the record, we didn’t have any difficulty at all getting the ’07 Renegade across the border into Ontario. But that was because we were “just visiting” at that point. We were simply going to the races, then returning back to Indiana. We weren’t actually exporting an RV at that point. Remember the one where the Mertzes and the Ricardos were riding bikes across the France – Italy border? Lucy, being the last one to cross, realizes she doesn’t have her passport. Now Ethel is on the French side of the border and Lucy is on Italian side, while the guys pedal back to Nice to find Lucy’s passport. Ricky arrives on the French side and gives Lucy’s passport to the Italian border guard. Lucy is permitted into France and Ricky takes her passport for safekeeping. Then, the Italian guard goes off duty and is replaced by another guard. Ricky starts off on his bike and Lucy remembers she left her bike on the Italian side. She goes under the border rail into Italy to get her bike while the new guard is still in the office. He comes out to work the border, and Lucy approaches the border with her bike. He asks for her passport but it has gone ahead with Ricky. Lucy again is stranded alone in Italy. We did this about a dozen times, and we had to “get clearance” each time as to why we were there. 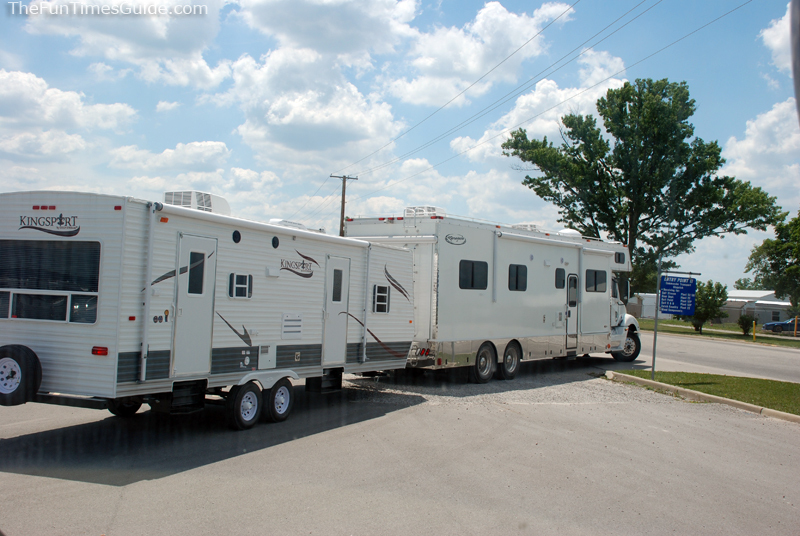 While on the Canadian side, we placed phone calls to the RV broker who had prepared the paperwork for us to export this RV from the U.S. into Canada, the RV dealer who was waiting for his RV, and others whom we hoped could assist us back in the States. We had to keep walking over to the U.S. side to ask the border guys questions… then back to the Canada side to phone people the answers. (Our cell phones didn’t work on the U.S. or the Canada side… Cingular/AT&T.) Four hours later, our RV was approved for export from the U.S into Canada. By the way… our friend who was driving a brand spankin’ new RV… he got through without any hassles. 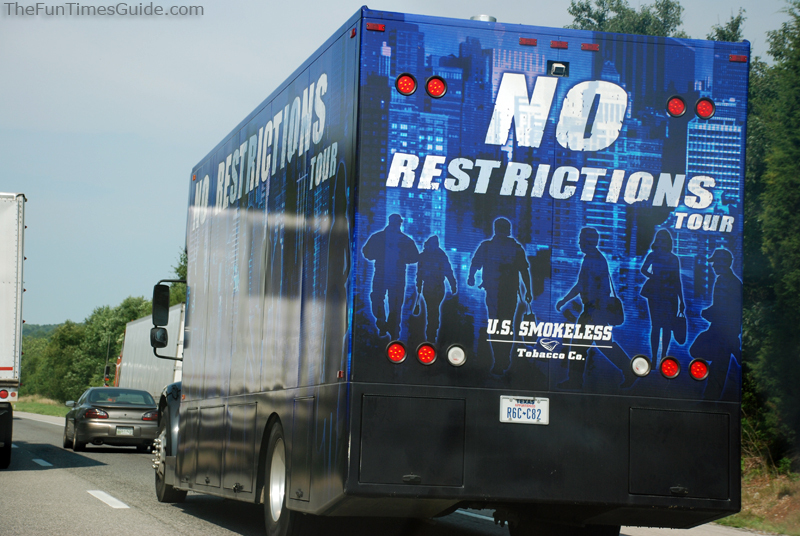 There aren’t the same restrictions on new RVs being transported into Canada. 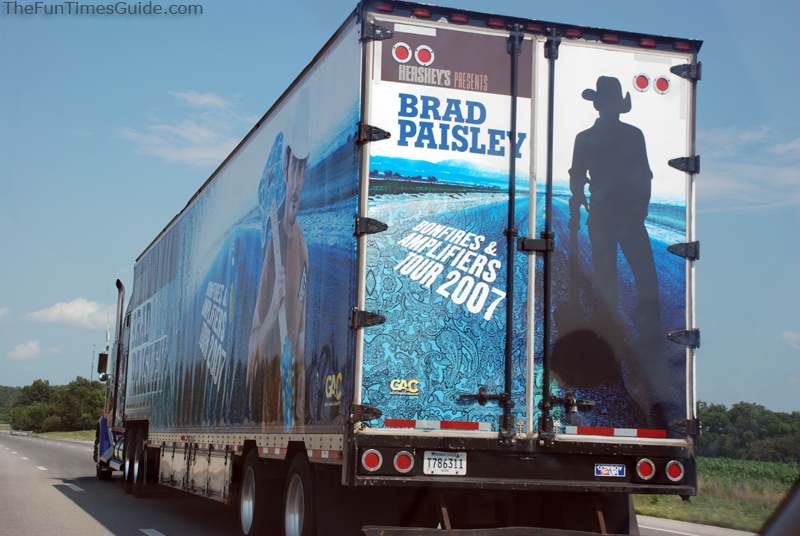 This isn’t the first time we’ve followed a Country Music superstar out of town. Jim photographed the Brooks & Dunn entourage, too.